As we saw yesterday, the accusations from the BBC, Washington Post, and Cnet saying that Apple was trying to "quietly" recommend antivirus software were false: Our quick fact check showed it was all an update to an old tech note. Now, Apple has removed the articles entirely. 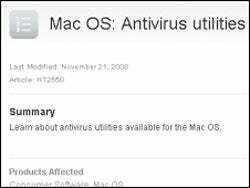 It seems that Apple has thought twice about the whole antivirus situation and declared the article entirely obsolete, putting it in line with their Mac and PC "Virus" TV commercial. Elinor Mills, who originally wrote and later corrected the Cnet article, has written to me saying that she finds unfair that we have characterized her editing as "quiet"—much in the same way herself and the BBC characterized Apple's Tech Note. She points out that she has been the only writer who has actually published a correction note on the original article, editing out the offending parts. She also accuses us of misrepresenting her editing as a "cover-up" of her mistakes (something that we never said). She is right that she's the only one who has actually wrote a vague correction note. However, we believe that this correction note—and the sharp editing—tiptoed over the faulty reporting, trying to minimize the huge mistake—which took us two minutes to check—and the fact this was a complete non-story to begin with. Like I painfully learnt myself, I know there can be mistakes made in the rush of the news hunting. But, like in print—where newspapers publish retractions, leaving a record of what was exactly wrong—, here in Gizmodo we believe that when we make a mistake, we need to highlight it as strongly as we reported on the story in the first place. We believe this was not the case for Cnet, even if her work was light years ahead of the BBC's complete disregarding of their mistakes. —J.D.